We present global fits of cosmologically stable axion-like particle and QCD axion models in the mass range 0.1 neV to 10 eV. We focus on the case where the Peccei-Quinn symmetry is broken before the end of inflation, such that the initial value of the axion field can be considered to be homogeneous throughout the visible Universe. We include detailed likelihood functions from light-shining-through-wall experiments, haloscopes, helioscopes, the axion relic density, horizontal branch stars, supernova 1987A, white dwarf cooling, and gamma-ray observations. We carry out both frequentist and Bayesian analyses, with and without the inclusion of white dwarf cooling. We explore the degree of fine-tuning present in different models and identify parameter regions where it is possible for QCD axion models to account for both the dark matter in the Universe and the cooling hints, comparing them to specific DFSZ- and KSVZ-type models. We find the most credible parameter regions, allowing us to set (prior-dependent) upper and lower bounds on the axion mass. Our analysis also suggests that QCD axions in this scenario most probably make up a non-negligible but sub-dominant component of the dark matter in the Universe. A. De Angelis, G. Galanti and M. Roncadelli, Relevance of axion-like particles for very-high-energy astrophysics, Phys. Rev. D 84 (2011) 105030 [Erratum ibid. D 87 (2013) 109903] [arXiv:1106.1132] [INSPIRE]. GAMBIT collaboration, GAMBIT: the Global And Modular Beyond-the-standard-model Inference Tool, Eur. Phys. J. C 77 (2017) 784 [arXiv:1705.07908] [INSPIRE]. GAMBIT collaboration, ColliderBit: a GAMBIT module for the calculation of high-energy collider observables and likelihoods, Eur. Phys. J. C 77 (2017) 795 [arXiv:1705.07919] [INSPIRE]. The GAMBIT Dark Matter Workgroup collaboration, DarkBit: a GAMBIT module for computing dark matter observables and likelihoods, Eur. Phys. J. C 77 (2017) 831 [arXiv:1705.07920] [INSPIRE]. The GAMBIT Flavour Workgroup collaboration, FlavBit: a GAMBIT module for computing flavour observables and likelihoods, Eur. Phys. J. C 77 (2017) 786 [arXiv:1705.07933] [INSPIRE]. GAMBIT Models Workgroup collaboration, SpecBit, DecayBit and PrecisionBit: GAMBIT modules for computing mass spectra, particle decay rates and precision observables, Eur. Phys. J. C 78 (2018) 22 [arXiv:1705.07936] [INSPIRE]. GAMBIT collaboration, Comparison of statistical sampling methods with ScannerBit, the GAMBIT scanning module, Eur. Phys. J. C 77 (2017) 761 [arXiv:1705.07959] [INSPIRE]. GAMBIT collaboration, A global fit of the MSSM with GAMBIT, Eur. Phys. J. C 77 (2017) 879 [arXiv:1705.07917] [INSPIRE]. GAMBIT collaboration, Status of the scalar singlet dark matter model, Eur. Phys. J. C 77 (2017) 568 [arXiv:1705.07931] [INSPIRE]. GAMBIT collaboration, Global fits of GUT-scale SUSY models with GAMBIT, Eur. Phys. J. C 77 (2017) 824 [arXiv:1705.07935] [INSPIRE]. P. Athron et al., Impact of vacuum stability, perturbativity and XENON1T on global fits of ℤ 2 and ℤ 3 scalar singlet dark matter, Eur. Phys. J. C 78 (2018) 830 [arXiv:1806.11281] [INSPIRE]. GAMBIT collaboration, Global analyses of Higgs portal singlet dark matter models using GAMBIT, Eur. Phys. J. C 79 (2019) 38 [arXiv:1808.10465] [INSPIRE]. GAMBIT collaboration, Combined collider constraints on neutralinos and charginos, arXiv:1809.02097 [INSPIRE]. R.J. Crewther, P. Di Vecchia, G. Veneziano and E. Witten, Chiral estimate of the electric dipole moment of the neutron in quantum chromodynamics, Phys. Lett. 88B (1979) 123 [Erratum ibid. B 91 (1980) 487] [INSPIRE]. M. Pospelov and A. Ritz, Theta induced electric dipole moment of the neutron via QCD sum rules, Phys. Rev. Lett. 83 (1999) 2526 [hep-ph/9904483] [INSPIRE]. K. Strobl and T.J. Weiler, Anharmonic evolution of the cosmic axion density spectrum, Phys. Rev. D 50 (1994) 7690 [astro-ph/9405028] [INSPIRE]. R.A. Battye and E.P.S. Shellard, Global string radiation, Nucl. Phys. B 423 (1994) 260 [astro-ph/9311017] [INSPIRE]. R.A. Battye and E.P.S. Shellard, Axion string constraints, Phys. Rev. Lett. 73 (1994) 2954 [Erratum ibid. 76 (1996) 2203] [astro-ph/9403018] [INSPIRE]. C. Hagmann, S. Chang and P. Sikivie, Axions from string decay, Nucl. Phys. Proc. Suppl. 72 (1999) 81 [hep-ph/9807428] [INSPIRE]. M. Yamaguchi, M. Kawasaki and J. Yokoyama, Evolution of axionic strings and spectrum of axions radiated from them, Phys. Rev. Lett. 82 (1999) 4578 [hep-ph/9811311] [INSPIRE]. C. Hagmann, S. Chang and P. Sikivie, Axion radiation from strings, Phys. Rev. D 63 (2001) 125018 [hep-ph/0012361] [INSPIRE]. T. Hiramatsu, M. Kawasaki, K. Saikawa and T. Sekiguchi, Production of dark matter axions from collapse of string-wall systems, Phys. Rev. D 85 (2012) 105020 [Erratum ibid. D 86 (2012) 089902] [arXiv:1202.5851] [INSPIRE]. P. Sikivie, Axion cosmology, Lect. Notes Phys. 741 (2008) 19 [astro-ph/0610440] [INSPIRE]. M.S. Turner, Early-universe thermal production of not-so-invisible axions, Phys. Rev. Lett. 59 (1987) 2489 [Erratum ibid. 60 (1988) 1101] [INSPIRE]. S. Chang and K. Choi, Hadronic axion window and the big bang nucleosynthesis, Phys. Lett. B 316 (1993) 51 [hep-ph/9306216] [INSPIRE]. S. Hannestad, A. Mirizzi and G. Raffelt, A new cosmological mass limit on thermal relic axions, JCAP 07 (2005) 002 [hep-ph/0504059] [INSPIRE]. E. Masso, F. Rota and G. Zsembinszki, Axion thermalization in the early universe, Phys. Rev. D 66 (2002) 023004 [hep-ph/0203221] [INSPIRE]. S. Hannestad and G. Raffelt, Cosmological mass limits on neutrinos, axions and other light particles, JCAP 04 (2004) 008 [hep-ph/0312154] [INSPIRE]. M. Srednicki, Axion couplings to matter. 1. CP conserving parts, Nucl. Phys. B 260 (1985) 689 [INSPIRE]. M.J. Dolan, F. Kahlhoefer, C. McCabe and K. Schmidt-Hoberg, A taste of dark matter: flavour constraints on pseudoscalar mediators, JHEP 03 (2015) 171 [Erratum ibid. 07 (2015) 103] [arXiv:1412.5174] [INSPIRE]. S.L. Cheng, C.Q. Geng and W.T. Ni, Axion-photon couplings in invisible axion models, Phys. Rev. D 52 (1995) 3132 [hep-ph/9506295] [INSPIRE]. J.E. Kim, Constraints on very light axions from cavity experiments, Phys. Rev. D 58 (1998) 055006 [hep-ph/9802220] [INSPIRE]. 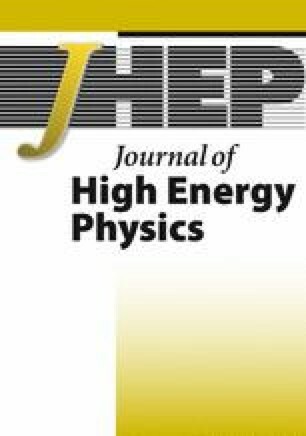 CAST collaboration, An improved limit on the axion-photon coupling from the CAST experiment, JCAP 04 (2007) 010 [hep-ex/0702006] [INSPIRE]. CAST collaboration, New CAST limit on the axion-photon interaction, Nature Phys. 13 (2017) 584 [arXiv:1705.02290] [INSPIRE]. S. De Panfilis et al., Limits on the abundance and coupling of cosmic axions at 4.5 μev < m a < 5.0 μev, Phys. Rev. Lett. 59 (1987) 839 [INSPIRE]. ADMX collaboration, Results from a high sensitivity search for cosmic axions, Phys. Rev. Lett. 80 (1998) 2043 [astro-ph/9801286] [INSPIRE]. ADMX collaboration, Large scale microwave cavity search for dark matter axions, Phys. Rev. D 64 (2001) 092003 [INSPIRE]. ADMX collaboration, An improved RF cavity search for halo axions, Phys. Rev. D 69 (2004) 011101 [astro-ph/0310042] [INSPIRE]. ADMX collaboration, A high resolution search for dark-matter axions, Phys. Rev. D 74 (2006) 012006 [astro-ph/0603108] [INSPIRE]. ADMX collaboration, A SQUID-based microwave cavity search for dark-matter axions, Phys. Rev. Lett. 104 (2010) 041301 [arXiv:0910.5914] [INSPIRE]. ADMX collaboration, A search for invisible axion dark matter with the axion dark matter experiment, Phys. Rev. Lett. 120 (2018) 151301 [arXiv:1804.05750] [INSPIRE]. H.E.S.S. collaboration, Constraints on axionlike particles with H.E.S.S. from the irregularity of the PKS 2155-304 energy spectrum, Phys. Rev. D 88 (2013) 102003 [arXiv:1311.3148] [INSPIRE]. A.A. Anselm, Arion ↔ photon oscillations in a steady magnetic field (in Russian), Yad. Fiz. 42 (1985) 1480 [INSPIRE]. ALPS collaboration, Resonant laser power build-up in ALPS: a ‘Light-shining-through-walls’ experiment, Nucl. Instrum. Meth. A 612 (2009) 83 [arXiv:0905.4159] [INSPIRE]. OSQAR collaboration, First results from the OSQAR photon regeneration experiment: no light shining through a wall, Phys. Rev. D 78 (2008) 092003 [arXiv:0712.3362] [INSPIRE]. OSQAR collaboration, New exclusion limits on scalar and pseudoscalar axionlike particles from light shining through a wall, Phys. Rev. D 92 (2015) 092002 [arXiv:1506.08082] [INSPIRE]. G.J. Feldman and R.D. Cousins, A unified approach to the classical statistical analysis of small signals, Phys. Rev. D 57 (1998) 3873 [physics/9711021] [INSPIRE]. P. Sikivie, Experimental tests of the invisible axion, Phys. Rev. Lett. 51 (1983) 1415 [Erratum ibid. 52 (1984) 695] [INSPIRE]. A.R. Zhitnitsky and Yu. I. Skovpen, On production and detecting of axions at penetration of electrons through matter (in Russian), Sov. J. Nucl. Phys. 29 (1979) 513 [Yad. Fiz. 29 (1979) 995] [INSPIRE]. J.N. Bahcall and M.H. Pinsonneault, What do we (not) know theoretically about solar neutrino fluxes?, Phys. Rev. Lett. 92 (2004) 121301 [astro-ph/0402114] [INSPIRE]. ADMX collaboration, Experimental constraints on the axion dark matter halo density, Astrophys. J. 571 (2002) L27 [astro-ph/0104200] [INSPIRE]. ADMX collaboration, Design and performance of the ADMX SQUID-based microwave receiver, Nucl. Instrum. Meth. A 656 (2011) 39 [arXiv:1105.4203] [INSPIRE]. C. Csáki, N. Kaloper and J. Terning, Dimming supernovae without cosmic acceleration, Phys. Rev. Lett. 88 (2002) 161302 [hep-ph/0111311] [INSPIRE]. Y. Grossman, S. Roy and J. Zupan, Effects of initial axion production and photon axion oscillation on type-IA supernova dimming, Phys. Lett. B 543 (2002) 23 [hep-ph/0204216] [INSPIRE]. G. Galanti and M. Roncadelli, Comment on “Irregularity in gamma ray source spectra as a signature of axion-like particles”, arXiv:1305.2114 [INSPIRE]. Fermi-LAT collaboration, Search for spectral irregularities due to photon-axionlike-particle oscillations with the Fermi Large Area Telescope, Phys. Rev. Lett. 116 (2016) 161101 [arXiv:1603.06978] [INSPIRE]. A. Mirizzi, G.G. Raffelt and P.D. Serpico, Photon-axion conversion in intergalactic magnetic fields and cosmological consequences, Lect. Notes Phys. 741 (2008) 115 [astro-ph/0607415] [INSPIRE]. J.W. Brockway, E.D. Carlson and G.G. Raffelt, SN1987A gamma-ray limits on the conversion of pseudoscalars, Phys. Lett. B 383 (1996) 439 [astro-ph/9605197] [INSPIRE]. J.A. Grifols, E. Masso and R. Toldra, Gamma-rays from SN1987A due to pseudoscalar conversion, Phys. Rev. Lett. 77 (1996) 2372 [astro-ph/9606028] [INSPIRE]. M. Salaris, M. Riello, S. Cassisi and G. Piotto, The initial helium abundance of the Galactic globular cluster system, Astron. Astrophys. 420 (2004) 911 [astro-ph/0403600] [INSPIRE]. M. Nakagawa, T. Adachi, Y. Kohyama and N. Itoh, Axion bremsstrahlung in dense stars. II — Phonon contributions, Astrophys. J. 326 (1988) 241 [INSPIRE]. T. Altherr, E. Petitgirard and T. del Rio Gaztelurrutia, Axion emission from red giants and white dwarfs, Astropart. Phys. 2 (1994) 175 [hep-ph/9310304] [INSPIRE]. A.H. Corsico et al., The potential of the variable DA white dwarf G117-B15A as a tool for fundamental physics, New Astron. 6 (2001) 197 [astro-ph/0104103] [INSPIRE]. F. Feroz, M.P. Hobson, E. Cameron and A.N. Pettitt, Importance nested sampling and the MultiNest algorithm, arXiv:1306.2144 [INSPIRE]. L. Visinelli and S. Vagnozzi, Cosmological window onto the string axiverse and the supersymmetry breaking scale, arXiv:1809.06382 [INSPIRE]. Particle Data Group collaboration, Review of particle physics, Chin. Phys. C 40 (2016) 100001 [INSPIRE]. 1.Department of Physics, Imperial College London, Blackett LaboratoryLondonU.K.